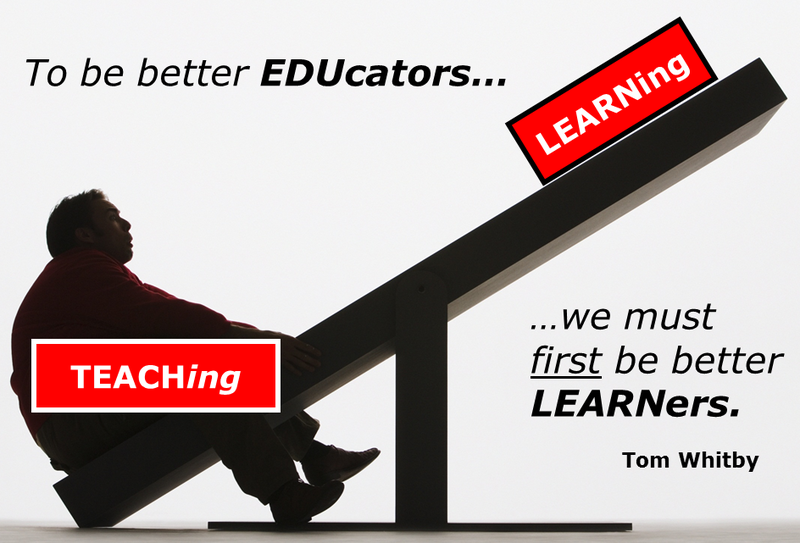 I originally wrote this as a reflection for a doctoral course I am taking in Professional Learning for Educators. When class first began, our teacher made it very clear that we would NOT be learning about professional development, but instead we would be studying professional learning. I was immediately intrigued and curious about the difference. I wrote this reflection after reading the first chapter of our course text, and thought some of you may be interested in reading about the difference as well. Develop: verb; “to cause to grow, change, mature, or advance.” Developing is not a word typically used to describe consciously made actions. Often, development happens to people or objects. Policies, property, film, and expectations are developed by people for their purposes. The objects of this “development” often have very little say in the process. Such is the case with most staff development, in-service, and training events educators have come to historically associate with the phrase “professional development.” Over the course of time, professional development has become closely linked with the top-down, training model of inservice based on the “assumption that teachers need direct instruction about how to improve their skills and master new strategies” (Martin, Kragler, Quatroche, & Bauserman, 2014, pg. 7) In addition, these skills and strategies are typically delivered in a one size fits all, sit and get session – the antithesis of good teaching practices. Fortunately, more schools and school districts are seeking ways to engage teachers in authentic, valuable learning experiences. The concept of professional learning looks more like “ownership over compliance, conversation over transmission, deep understanding over enacting rules and routines, and goal-directed activity over content coverage” (Martin et al., 2014, pg. 147). Essentially, professional learning is a growth in practice model that values active engagement, teacher voice, creation and collaboration, inquiry, and reflection. This type of learning is mostly happening through professional learning communities, but it is possible for professional learning to happen even in schools that do not have formalized PLCs for their teachers. So how can schools move from managing and controlling teacher development to facilitating and encouraging professional learning and growth, with or without a formal PLC? 1. Give teachers a voice in their professional learning. Have conversations with both individuals and teams of teachers to help them develop meaningful learning goals for the year. Support those goals in any way you can and check in frequently to encourage and provide assistance. 2. Honor the expertise in your building. Tap teachers to share their knowledge, experiences, and successes during staff meetings. Asking a different teacher to share for even five minutes each week can help build a climate of trust, collaboration, and growth. 3. Encourage inquiry as a stance. Ask teachers or teacher teams to develop a “What if..?” question during a staff meeting and report on their findings the next time they meet. “What if we did not record homework in our grade books?” “What if I started a genius hour project in my classroom?” Giving teachers permission to explore and take risks will encourage an environment of learning and growth. 4. Give teachers tools for professional discussion. Many teachers, especially those who have never been part of a PLC, are used to working in isolation. Asking teachers to collaborate and share their learning with one another might be a leap for some. There are a multitude of professional learning protocols, like these from the Critical Friends Group, that can help guide teachers through the process of collaborative learning. 5. Seek ways to make mandated training relevant. Whether the training is mandated by the district or the state, it is rarely relevant for 100% of the staff. Be transparent with your teachers about the requirements and encourage their input for ways to make it relevant. Would breaking the staff into groups based on prior knowledge be helpful? Can you seek teacher leaders to facilitate sessions about how the initiative relates to specific content or pedagogy? 6. Model professional learning. Network with other leaders. Share your learning with your staff. Don’t pretend to have all the answers. Ask questions, investigate, reflect. In short, continue to grow in your own knowledge and skills the same way you expect your staff and students to! 1. Seek-out professional learning networks to connect with other educators and expose yourself to the latest and greatest information in your field. These do not need to be paid memberships to national organizations. There are groups of educators sharing ideas on a variety of social networks including Twitter, LinkedIn, Google +, and Facebook. 2. Continuously seek out opportunities for collaboration and idea sharing. After all, teachers are often the best teachers for teachers. The teachers’ lounge, playground, hallway during a passing period, or even a short walk with a colleague to the parking lot can be opportunities to swap ideas, share successes, or ask questions. Don’t be afraid to engage your colleagues in talk about what is happening in your classroom. 3. Be willing to help administration. Offer to facilitate professional learning experiences for your peers based on your strengths. If asked, provide input on the professional learning opportunities provided to you, and if necessary, give suggestions for improvement. 4. Become a researcher. The only way to know if something will work for your classroom or for your kids is to try it out! It is okay to take risks and push yourself as a professional if you think it will benefit your students. Not everything you try is going to work well 100% of the time, but doing what you have always done will not help you or your students grow. Like any good researcher, make sure you share your results with your colleagues. 5. Get in the habit of reflecting. Many good teachers are experimenting, learning, growing and changing each and every day. Most good teachers, though, are often too busy caring about their students’ learning to stop and take stock of their own. Reflection can happen in many forms – blogging, doodling, jotting a list of positives and negatives, snapping some photographs of the day’s activities, taking a moment to audio record your thoughts at the end of the day. Whatever works for you, stop and take note of the ways you are growing as a professional and the areas in which you want to get better. Remember, good teachers must continue to grow in their knowledge and practice in ways that are relevant to their own areas of weakness and need. While many legislators and leaders may look for the silver bullet to do the job quickly, top down, one size fits all, staff development sessions are rarely the solution. “Evidence shows that teacher involvement in creating knowledge, help in leading the change, participation in outside as well as inside groups, and learning from others must be a significant part of professional learning” (Martin, et al., 2014, pg. 19). Martin, L.E., Kralger, S, Quatroche, D. J., & Bauserman, K.L (2014). Handbook of professional development in education: Successful models and practices, Pre-K-12. New York: Guildford Press. Next How Policy is Affecting Professional Learning…and What You Can Do About It! Interesting thoughts, Kristen! I just posted similarly from the opposite perspective, where I advocate for PD as having more rigor and depth! Kristen, I think number five on the tips for teachers is especially important. Some of the best personal learning and district PD events that I’ve encountered include a hefty dose of personal reflection afterwards. That reflection can take on many different forms, but I find the opportunity worthwhile. Reflecting on past practices and sharing/learning from others may encourage educators to change their practices for the better. You may remember me from NIU – we took 531 w/ Dr. Robinson and one or two of Dr. Butler’s classes together. I salute you for continuing with the doctorate. I read your PD reflection with interest. Our smallish district has paid for some very expensive “guru du jour” speakers in the past. Even if they’re good, you reach a saturation point where it becomes a lot of white noise. Plus, there is always a percentage of the audience for whom there is little or no relevance. It was a huge success, especially as it was already three days into what should have been summer vacation. You are right in that teaching can be very insular, even when you’re meeting with your team every day. There is just so much other ground to cover. As you pointed out, you have to seize opportunities to share ideas and strategies. This was one way we were able to do that, and will hopefully be able to do it again at some point. Enjoy the rest of your summer, Kristen. That sounds great! It is awesome that admin saw the value in and supported PD chosen and facilitated by teachers. I am hopeful that many more schools and districts will continue to make steps in the right direction. Excellent perspective. I will surely create PD that is professional LEARNING based on needs and talents of my attendees. This is the next level of effectiveness- thanks for sharing! Kristen, I read and shared this when you first wrote it, and recently re-discovered it. This is an amazing piece of writing that serves as a call to action for all teachers and leaders. I am so fortunate to work for a leader who has a great vision for professional learning, but I know there are many who still fear giving up control and changing existing professional learning practices. Thanks again for putting this out there – I am sharing it again! Thanks for the interesting tips and advises.